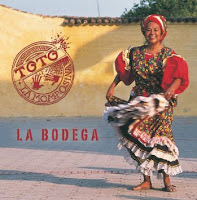 Folk singer Toto La Momposina is a legend in her native Colombia. She has had success in the US because Peter Gabriel signed her to his Real World label and she toured his WOMAD concert circuit. She was born Sonia Bazanta Vides Aug. 1, 1940 in Bolivar, Colombia. She grew up in a family of musicians. Her father was a drummer and her mother was a singer and a dancer. So that's where she learned the traditions of Colombian music. She performed with her parents until she went out on her own in 1968. Toto first recorded in the 80s when she was living in France. She moved back to Colombia in 1987. I guess the turning point for Toto was when Peter Gabriel signed her to his Real World label and she joined his WOMAD concert tour. Since then she has gotten a lot more international acclaim and she continues to tour with her band featuring her children and grandchildren. Yo Me Llamo Cumbia is from Toto's 2009 CD La Bodega. It was nominated for a Latin Grammy. Her latest CD Tambolero was released last year on Real World. This kind of music is not for everyone. But as I said, she's a legend in Colombia and she's been performing for 60 years. Here's Toto La Momposina performing Yo Me Llamo Cumbia at a WOMAD show in Reading, England. AccuRadio Song Of The Day-Love Inc.